It is time to cover the third issue of The Sandman where Morpheus is on the hunt for his stolen equipment. Last issue we found out the sand pouch is with John Constantine. Remember how these work!!! You read an issue in advance and then,you can come to the site. Now, let’s start. 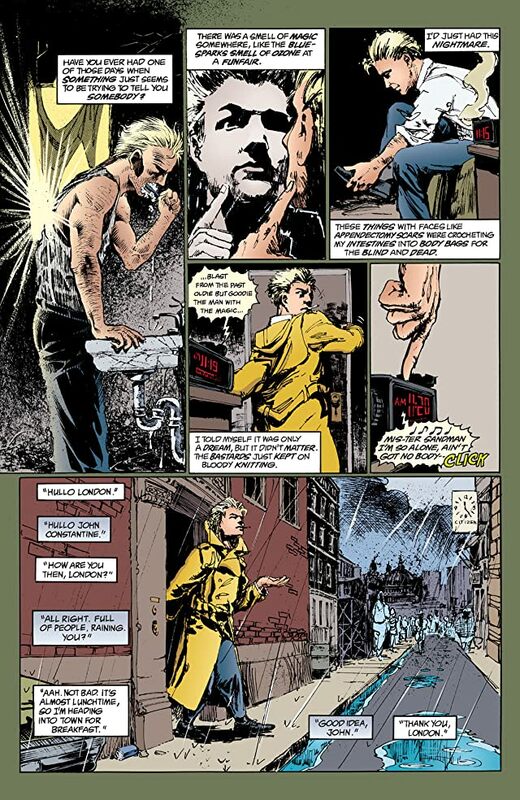 The issue starts off with John Constantine waking up, living quite a regular life. He’s listening to the song on the radio with Sandman as part of the lyrics…. interesting. On the street he ran into a lady he knew. She started screaming at and telling him that the Sandman is back….hmmmmm. 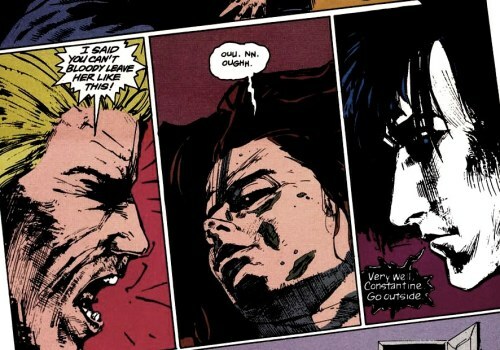 John Constantine began having bad nightmares and since then he wanted to investigate the Sandman case, but never did. For those who don’t know Constantine is a magician himself and specializes in different magic. While investigating a house to begin his search for Dream his answer comes to him. Morpheus comes in and wants his Sand Pouch back. John Constantine doesn’t know where it is, until a photograph of his love interest fell on the ground when he was earlier searching. In that photograph was his old friend named Rachael. He gave the pouch to her last. Now, Morpheus and Constantine are going to find Rachel. They enter a house where she lived in. Morpheus feels the power of the pouch. It’s near. The two make their way through the house, but without trouble it wasn’t. One of the rooms they encounter has human guts all over the walls. John Constantine also falls into an astral trans that has him falling. Morpheus wakes him up. This place has a negative effect on humans that is too much for a regular mortal life. Next, they encounter a room where on the walls we see some ugly green creatures which don’t allow the two to pass through. Morpheus identifies himself to the creatures. They are in shock when they hear his name. They apologize and allow him and John to pass through. Now, we are in the bedroom where Rachel is in. We see her. She is in a very fatal, weak state. Dream grabs the Sand Pouch and desires to leave, but John Constantine doesn’t wanna leave his friend is such state. It seemed like the sand was the only thing keeping her alive. Sandman agrees to this, but only if John exits the room. John left, Morpheus sprinkled his sand on Rachel. We see Rachel’s dream where she is with John Constantine happy, together in love. This was her final dream before her death. Morpheus walks out of the room to meet John. Constantine asks what happened, and Morpheus says, “She died peacefully. She died happy”. At the end John asks Dream if he can help him with his bad dreams, Morpheus does just that and leaves. I thought overall this was a nice issue, but I expected more from it. I thought that John had the pouch and that he would have to fight him to get it back. That would have been awesome to see. It was something I didn’t expect, which isn’t bad, just not what I would have preferred. There were many awesome scenes like the one in the house, but it took it a while to finally get there. The chemistry between Dream and Constantine was very entertaining to watch if it was a funny line or when one was saving the other. Maybe I expected more from a crossover with John Constantine, but I still enjoyed myself. I can’t wait to read the next issue when Morpheus runs into the Justice League! Until then, see ya! What did you think of the issue? I would love to hear your thoughts.